Hello! Sorry about the lapse between posts. We were enjoying a two-week adventure in Iceland. Unbelievable scenery – glaciers, mountains, basalt cliffs, bubbling mud pools, a geyser, geothermal pools, whales, dolphins, lava formations – and some of the freshest fish, lobster and lamb I’ve ever had. But I can say I didn’t see a single sweet potato…take that back, we did have sweet potato soup once. After being away for so long and not cooking, I always crave something comforting and homemade and involving vegetables. As much as we try to eat healthy while on vacation, we always are a bit deficient on the vegetable intake. So the body was seriously craving some veg. 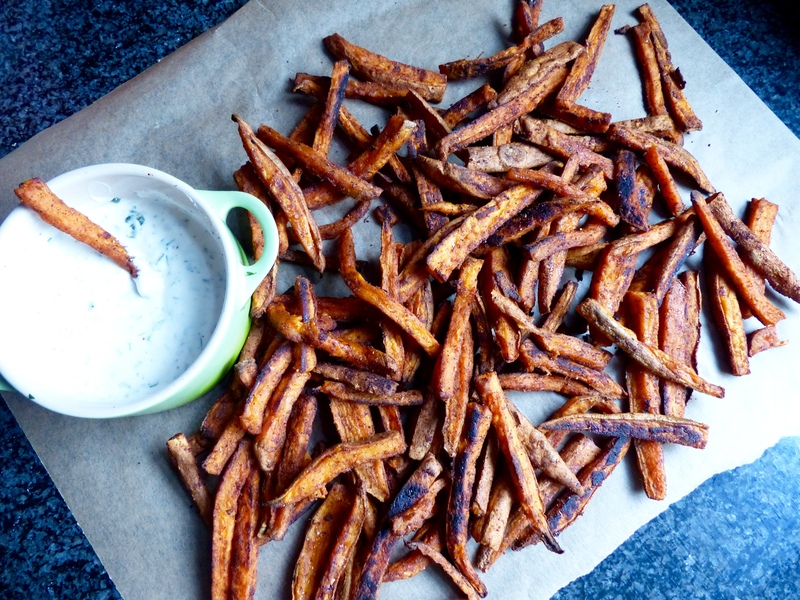 These sweet potato fries are baked rather than fried, so they’re good for you! They’re tossed with a spice mixture prior to baking which gives them a bit more interest and a little kick. But my favorite part is the creamy cilantro dip. OMG, I never want to ever have a fry without this stuff again. No matter how many fries I make, they never last long. So if you have hungry eaters, consider doubling the recipe. These go great with burgers or sandwiches or pretty much anything…embarrassingly enough, I have made a meal out of them on a few occasions. Enjoy! Preheat oven to 425º F (220º C). 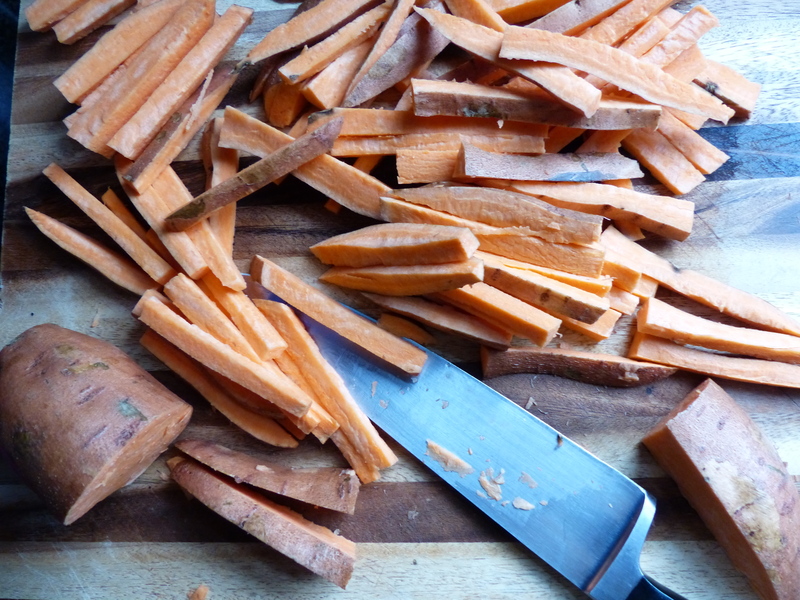 Cut sweet potatoes into skinny matchsticks, about 1/4″ (0.5 cm) thick and no longer than 4″ (10 cm) long. In a large bowl, toss the sweet potatoes with olive oil to coat. 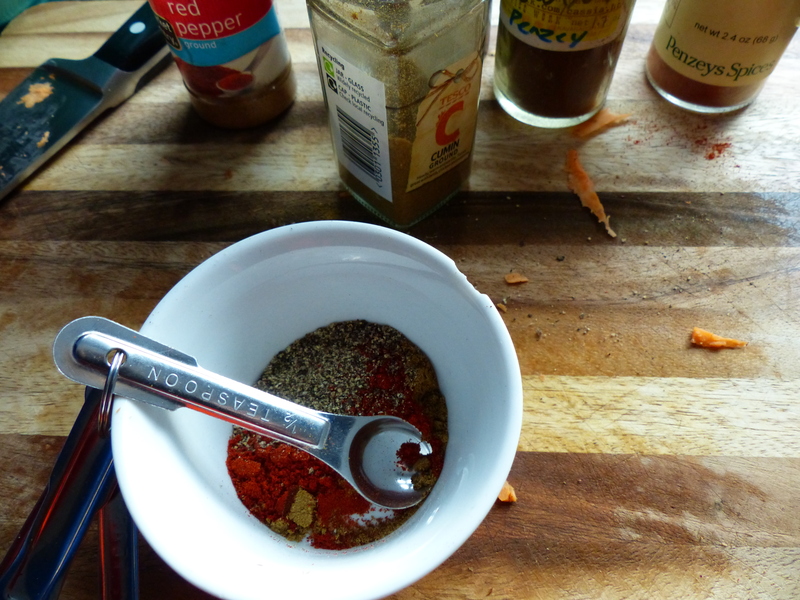 In a small bowl, combine the cumin, chili powder, paprika and black pepper. Sprinkle over the sweet potatoes and toss to evenly coat. Place sweet potatoes in a single layer on a baking sheet; separate between two baking sheets, if necessary. (Note that the potatoes will shrink while cooking, so they can be fairly crowded on the baking sheet, though still in a single layer.) Sprinkle with salt. Bake for 15 minutes, remove from oven and turn potatoes with a spatula. If you are using two baking sheets, rotate the sheets at this point. Bake for another 10 minutes. Potatoes should be browned and a bit crisp at this point. If not, turn potatoes again with a spatula and return to oven for 5 minute increments until done. 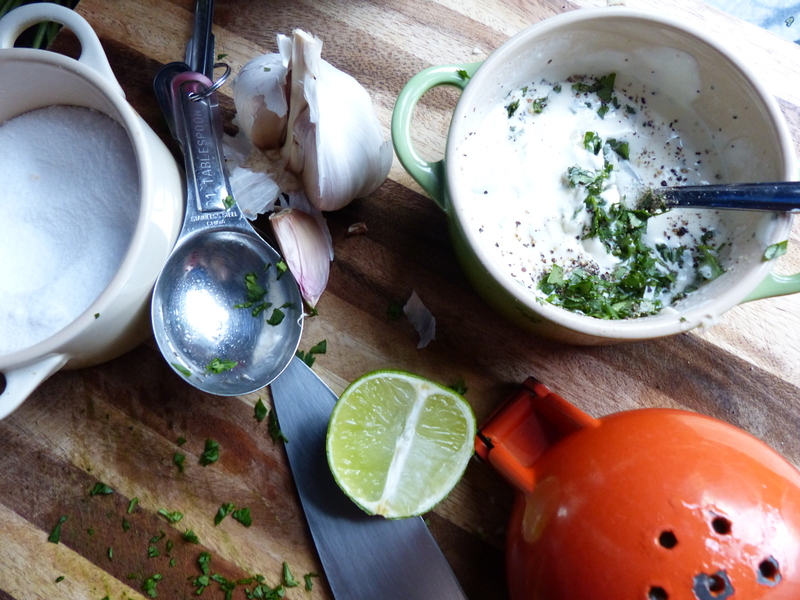 While the sweet potatoes are baking, make the creamy cilantro dip. Combine all the ingredients in a small bowl and stir to combine. 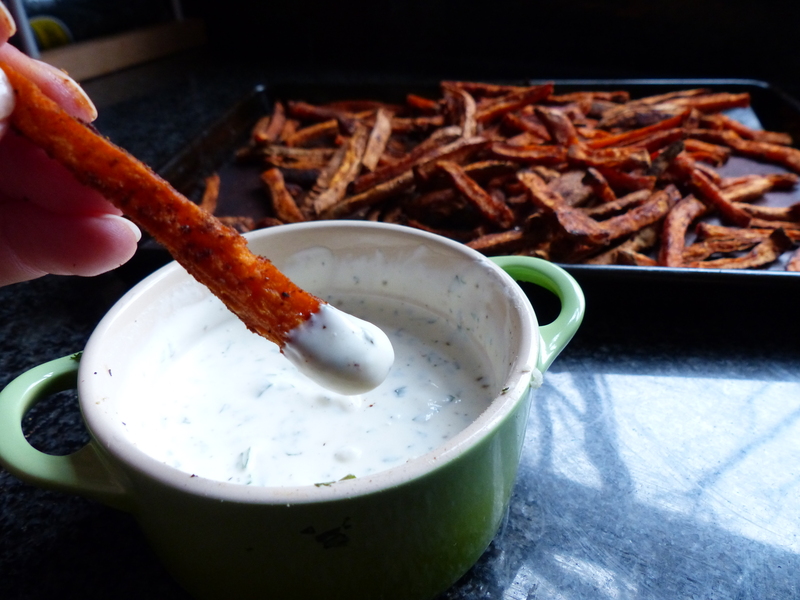 Serve the sweet potato fries hot along with the creamy cilantro dip. Thanks Two Aprons. Is there a tip for getting sweet potato chips to crisp up? White potato all good but I find the sweet ones go soggy? Yes getting them crunchy without frying is a challenge. This is what I’ve been doing….towards the end of cooking if they’re browned but still not crispy enough, I lower the cooking temperature and keep them in, tossing every 5 minutes. Good luck!